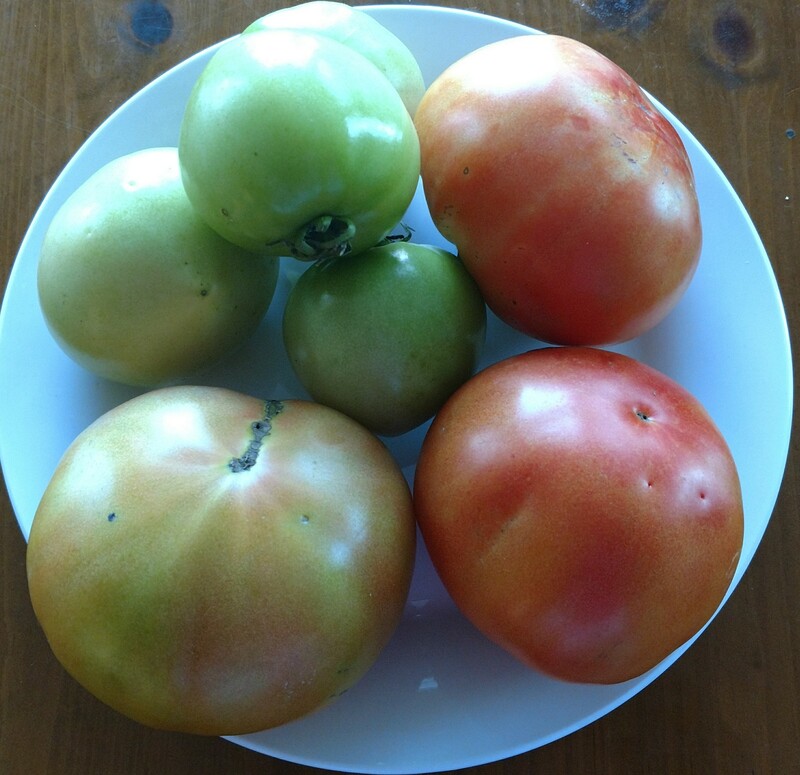 With the mild Fall temperatures and good rainfall, any tomatoes and egg plants growing were allowed to continue. The plants were covered to protect them from 3 frosts and 2 light freezes. 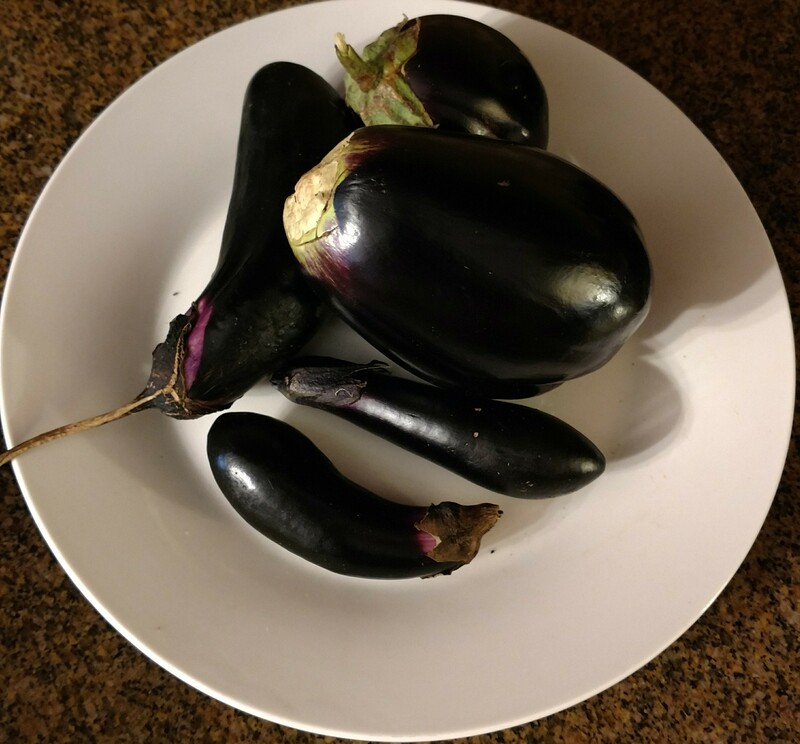 Earlier in the week, however, temperatures dipped down to the low 20’s (22 on the thermometer by the house), so we were forced to harvest any ripened egg plant and tomato fruit. Tomatoes are best when vine-ripened, however, they will ripen if picked when any “color” is seen (by color, I mean that the green has begun to turn yellow—even if only very faintly yellow). 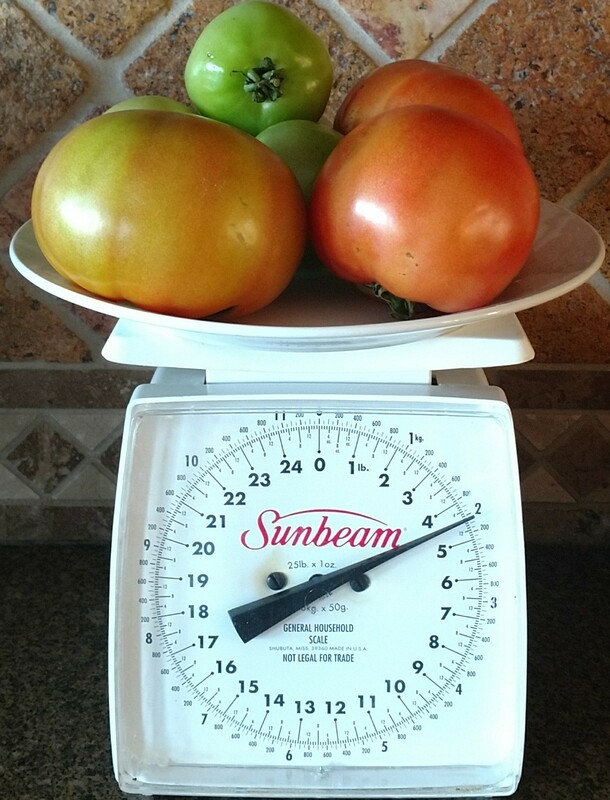 The tomatoes were place on a plate, then weighed. The plate, weighed before adding tomatoes, was right at 1 pound (about 454 grams). Plate plus tomatoes was about 4 1/2 pounds (just over 2 kilograms) so the tomatoes were actually close to 3 1/2 pounds ( about 1.6 kilograms). Although they are not fully ripened, I think the variety is “German Striped”. This tomato plant was a volunteer (not planted by me, probably a product of bird activity). It was growing in my daylily bed and I let it continue (just couldn’t resist adding a few tomatoes to the final tally for 2016). We have started growing veggies in raised beds, and we generate our own compost from kitchen waste and fallen leaves in the yard (I’ll be posting about that after Christmas as we begin to look ahead to the Spring Garden!) We use no chemicals (no herbicides for weeds, no fertilizer purchased in a box or can–just the prepared compost). Last, but not least — the egg plant harvest. While these fruit are usually much larger, the fact that they even made in the late Fall is awesome and certainly a bonus for us! Normally, we harvest the eggplant fruit throughout the summer — this plant is related to cotton and okra, so it does fairly well in heat, so long as it receives water. Eggplant can be sauteed, fried, or baked. Wishing all a Merry Christmas, and a Happy New Year — filled with gardening!